SiOO:X wood protection is a water-based impregnation system. It is based on proven silicate technology and natural products to give timber long life surface protection. Importantly it is completely safe, inert and environmentally friendly. It is manufactured in Sweden and consists of a two component system designed to interact and create this unique protection system. SiOO:X provides a long-term weathered look without leaving timber unprotected. SiOO:X is inspired by how nature protects itself using its own natural technology. It is not a coating and does not have any colouring but is a silicate based wood protection envelope. The system has two components. The first component called Wood Protector has tiny silicon molecules that penetrate into the timber where they react and over time form a strong protective layer. The second component called Surface Protector acts to seal and protect the first component until it is fully cured, and at the same time forms an inert water resistant envelope. The weathering process is mostly moisture activated but exposure to uv does also play a role. To speed up the weathering process we suggest that following application of the two components and installation it is recommended watering the timber every 2 to 3 days for 3 to 4 weeks. This will weather the timber to a silvery/grey, the process will then continue to develop over 12 to 24 months. Time taken will vary depending on the timber specie, exposure level, time of the year etc. Best results are achieved using SiOO:X on our fine bandsawn Vulcan product range. 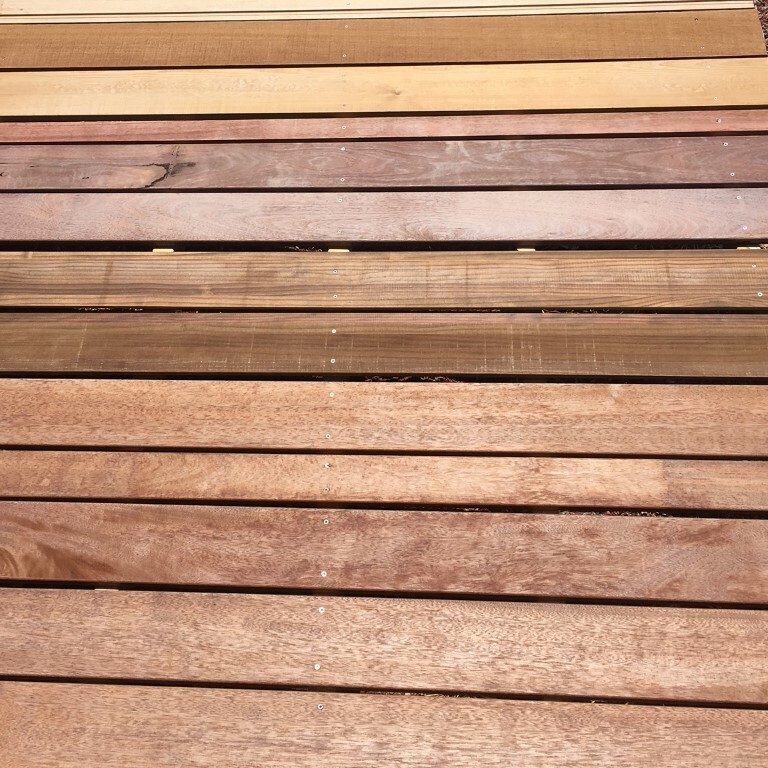 Time lapse SiOO:X coating system creates a weathered grey look to timber much quicker than nature can. Austim can supply SiOO:X components to you in 5 litre containers for DIY application, be sure to follow all instructions. For larger quantities we can offer in factory application so that all that is required on-site is installation and some small touching up. Virtually anything made of wood! Below is Austims real life testing carried out on a variety of timbers in late 2017, demonstrating how SiOO:X develops over time. We regularly watered these panels for a month and then left them alone. These panels are in a full exposed situation. Visit us at 252 Gnangara Road Landsdale and see for yourself.